Growing up the fall season was always a big deal. My mom had eleven brothers and sisters and since she was the oldest our house was always busy. There was always baking or cooking of some sort being done and it was by helping my mom get ready for parties that I learned to really cook. One of my favorite baking ingredients was pumpkin. My mom would make pumpkin pies and breads that were delicious and it was the one time of year that my mother allowed me to have pie for breakfast (since it had pumpkin in it I was able to argue that it was somewhat nutritious :). I seem to have passed on my love of pumpkin to my two boys, anything pumpkin related that I make they gobble up every last bite. Recently, I pureed a number of pumpkins that I found at a farmer's market in our area and have been baking recipes using the puree in the last month. While reading the Sunday paper I came across a recipe for Pumpkin Bread in the USA Weekend insert, using ginger instead of nutmeg, which looked delicious and different than my normal pumpkin bread recipe. This recipe has 12 ingredients. It makes 24 servings and takes approximately an hour to prepare and bake. All the ingredients are very basic and I already had all of them in my pantry cupboard or fridge. Instead of using canned pumpkin I used frozen puree that I had prepared a few weeks back. I found the baking temp to be a little too high since I was using dark coated pans, so I turned the oven down to 325 and baked about 10 minutes longer than the recipe suggested. I did notice that the sides of the bread browned quickly, so I tented the bread to cook the last 20 minutes or so. I followed the remainder of the recipe as written. If you like the taste of ginger and pumpkin, you will like this recipe. It has a very strong spice flavor and works well with melted butter. I wasn't sure if my sons would like this recipe due to the ginger, but my family ate both loves in about 3 days, so it was very popular. I love finding recipes that are different than the run of the mill traditional cookbook recipe and this recipe definitely fits the bill. A great lower sugar way to make pumpkin bread, which can also be modified to use applesauce instead of half the amount of butter. Overall, a delicious fall bread recipe. For the recipe go to Pumpkin Bread. This looks so good.... I love pumpkin bread! I'm a new GFC follower from Finding New Friends Weekend blog hop. Both of my kids are sick, so I've been slow going on the hop!!! @Ola Thanks followed you back! I LOVE pumpkin bread and have yet to find a recipe that really satisfies me! This one sounds great and I can't wait to try it! Thanks for sharing! This looks great! I have never had pumpkin bread. I could have some now. By the way, my mom is also from a family of 11! Take care and have a good week. Oh I love substituting butter and oil with applesauce. It still taste just as good if not better. I have been meaning to try pumpkin bread for a while now. This recipe sounds great, thanks for sharing it! @The New I hope you like this recipe if you try it! @Dvr Dame I love making substitutes with applesauce also, it cuts down a lot on the fat and tastes just as good! 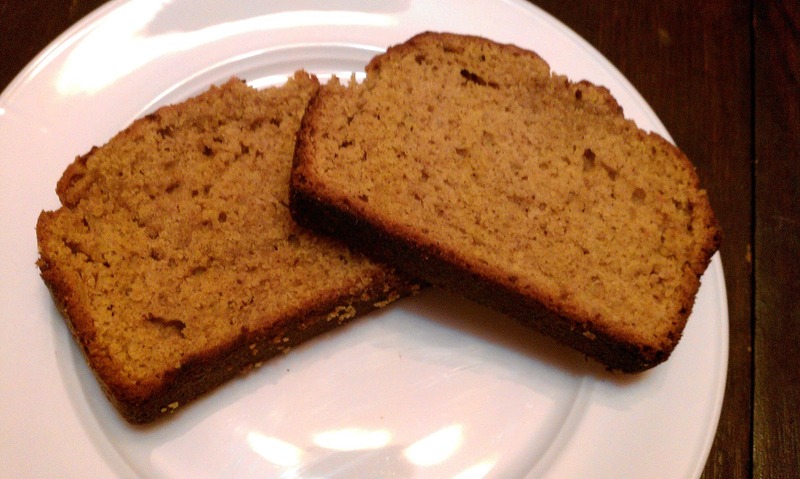 @Sheri Pumpkin bread is really easy, I hope you like the recipe if you use it! That looks delicious, I haven't eaten Pumpkin bread in such a long time. Now inspired to make a loaf :)I'm from Blogaholic Network.I followed via GFC. @Mia Thanks :) I love making pumpkin bread and it's very easy! I followed you back! I love pumpkin bread. Thanks for sharing. I love your blog and am now following you. @kimba88 I love pumpkin bread also, it has a great fall flavor! This looks wonderful :O) I can't wait to try it. @M.Hanks It tasted delicious and the ginger gave it a nice change of pace from the usual pumpkin bread recipes. Hope you like it when you try it!